This week we didn’t come close to completing the amount of work we did last week, mainly because we all got some bad allergy stuff happening on Thursday and a couple of play dates on Saturday. We usually use Saturday as our makeup day if we miss a day during the week. We still managed to get all of our world geography studies in and most of our basics. We visited Great Britain this week and while we had a lot of fun, it seemed a little flat to me. I guess because I’ve studied British history quite a bit in college and since the US used to be a British colony there wasn’t as much difference between our country and Great Britain as say between Russia and the US, which we studied last week. Plus the amount of books on GB is astounding!!! We could have spent a month on it and barely touched the resources available. We built Stonehenge out of Lego blocks. We had a British tea party with scones, sandwiches, and cake. And at the last minute I swapped out my planned science for a dinosaur dig since the first dinosaur bones were discovered in England and an Englishman invented the word “dinosaur” to describe these “terrible lizards”. Of course I checked out lots of great British children’s literature to read including King Arthur and Robin Hood stories, Wind in the Willows, Mother Goose nursery rhymes, Beatrix Potter stories, a story about Queen Elizabeth, some retellings of Romeo and Juliet and A Midsummer Night’s Dream, and biographies of Charles Dickens and Shakespeare. See what I mean? So many topics! Don’t forget that I am posting all of our world geography and science plans on my blog. Just click on Globe Trotting Girls in the tag cloud or on the specific links under the curriculum tab to take you to all of those posts. Math: We completed pages 73-96 in Math in Focus and she finished up the corresponding workbook pages. She also did some pages in Intensive Practice and Challenging Word Problems. Read Aloud: I started reading The Ordinary Princess by M. M. Kaye. This is a wonderful story and beautifully written. We are both enjoying it a lot! Literature: Chipette took her first test in K12’s literature course and did great! We also completed one lesson from Unit 2. Spelling: We completed one level in Apples and Pears. Language Arts: We read and discussed 12 pages in Grammar Island. Chipette did 4 pages from her New American Cursive book, and we did three days of lessons in Student Writing Intensive A. Independent Reading: Chipette read 20 pages from Emily’s Runaway Imagination. As part of Chipette’s independent work for third grade, she’s been learning to type correctly on the computer. We’ve been using Dance Mat Typing which is a free typing program from the BBC. There are four levels and underneath each level are three stages. She works on one stage for an entire week before moving on to the next stage the next week. It should take her about 12 weeks to get through the entire program before we move on to another free resource I’ve found. She LOVES Dance Mat Typing and I use it as the treat at the end of our school day. As you can see Magpie likes to watch and learn too! Math: She did 6 pages in her math workbook, and we did two lessons from MEP Reception. Phonics: We completed 2 lessons from Logic of English Foundations and she finished up Book A of Explode the Code Primer. Yay, Magpie!!! Handwriting: She did 4 pages in Doing It Carefully and practiced writing letters and words using a, d, g, and c in Italics. Logic: We finished one lesson in Lollipop Logic. Literature: We started our literature study of Curious George, but haven’t made it very far. Reading Mother Goose rhymes made a big impression on Magpie this week, so while I was working with Chipette during school, she grabbed the small marker board and drew Humpty Dumpty. I thought it was pretty good for a five year old, especially his face! 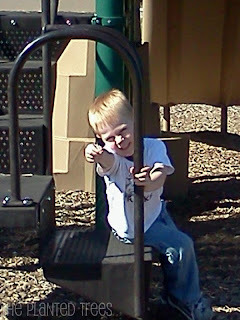 This week while the sisters were at our homeschool group, Monkey and I made our usual trip to the park. 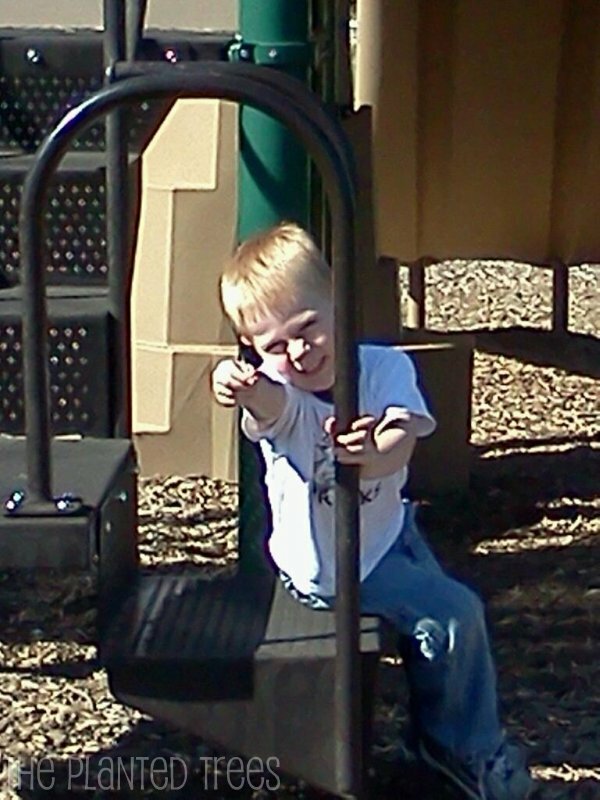 He found a feather by the swings and was so proud!